I am almost at the finish line. The pregnancy finish line that is. It has been an interesting ride to say the least. This time I around I am not on bed rest which has been a wonderful thing. For one thing I get to remain active and incorporate some safe pregnancy fitness routines into my life but more importantly, I am a mom of a busy and very active 2 year old. Bed rest just would not have been an option for her. LOL. 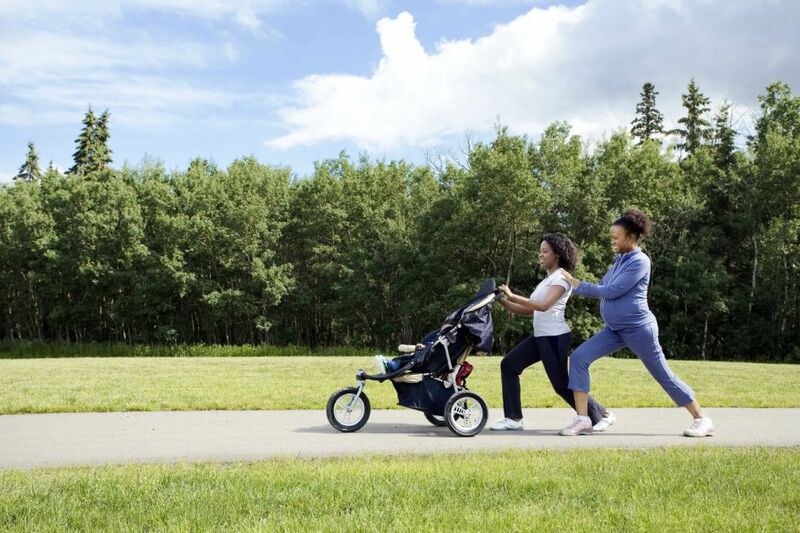 A part of staying healthy and fit during pregnancy is keeping up with doctor’s appointments. I will also consult my doctor, my pharmacist and yes doctor Google if necessary. This time around I probably only searched 10-15 things versus the hundreds when I was pregnant with Busy Bee. Ha! Last week I was in Sam’s Club and it was my lucky day! 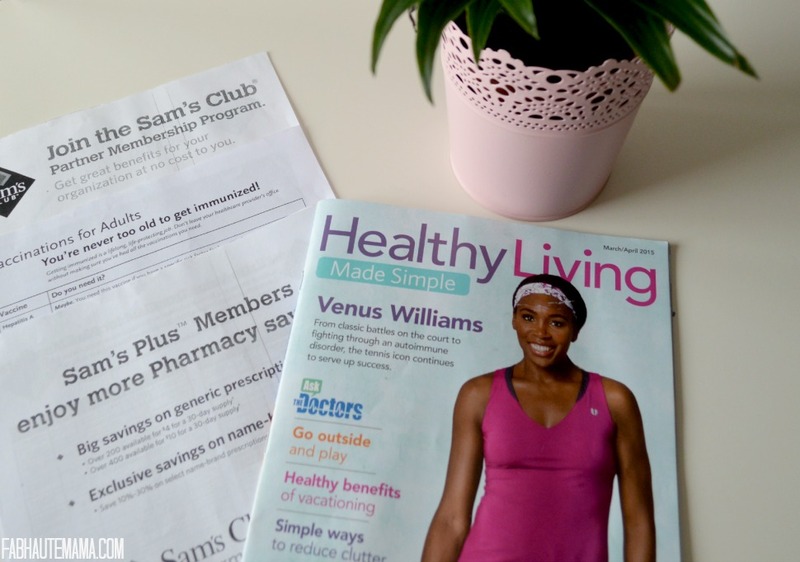 Not just because this mama needs bulk deals on so many things but because I was feeling a little dizzy and the free Sam’s Club Health Screening was taking place. Talk about on time. I signed up and waited to get checked out. 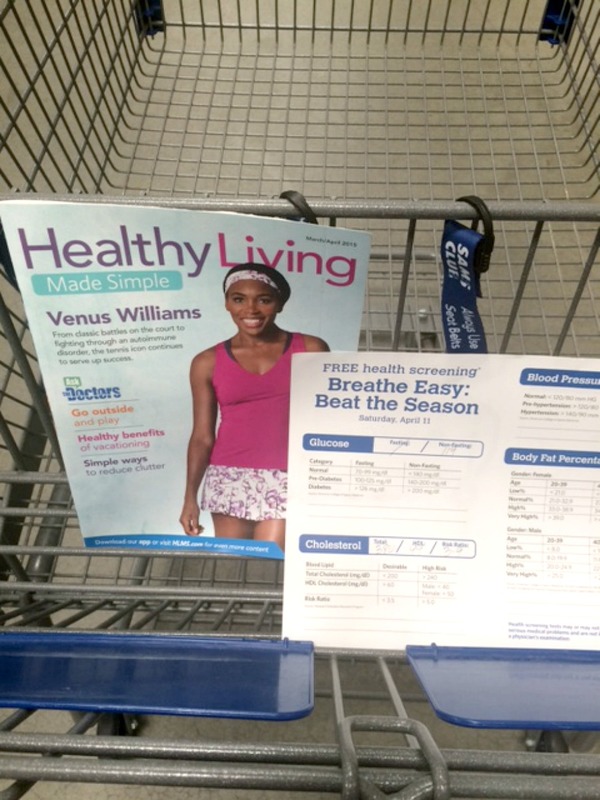 There were a lot of people waiting to be seen.The associates took their time, explained the process and results and provided resources including information for Sam’s Prescription plan, eye services and a copy of the Healthy Living Made Simple Magazine. With so much going on with healthcare and the increasing costs, this free health screening is so important for people in need and anyone in general who may be feeling under the weather. While I waited to be screened, I checked some of the articles in the magazine. The articles in the baby section are right on time. 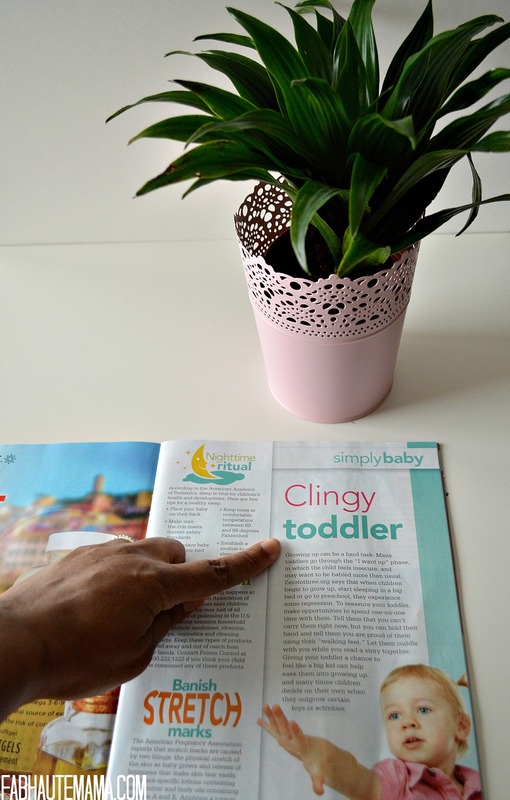 With my new addition on the way in a few weeks of course I need to read up on stretch mark tips for me, diaper rash tips for my little and adjusting my clingy toddler. Thanks Sam’s Club. The associate checked my pressure, my cholesterol, sugar and oxygen rate. I just knew my pressure was up but it wasn’t. Just another hot flash passing through.Body fat measurements and eye exams were also available. Now you know I did not get my body fat measured. I’m not crazy! With my results in hand I was off to shop. Taking the time out to get a free screening was great. I felt much better and definitely less worried. My cholesterol was high so I made sure to mention it to my doctor when I went for my appointment the following Monday. 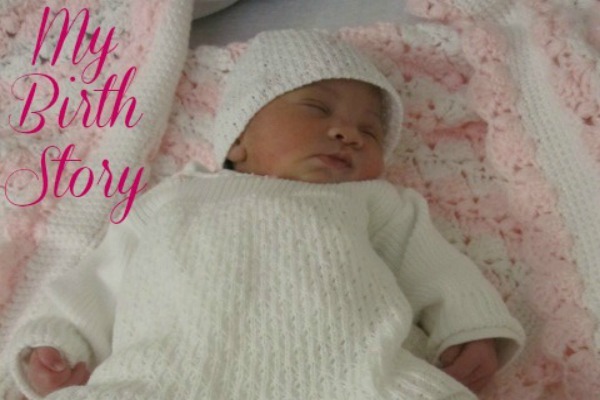 She advised of why it would be high in pregnancy and that we would check it post delivery. 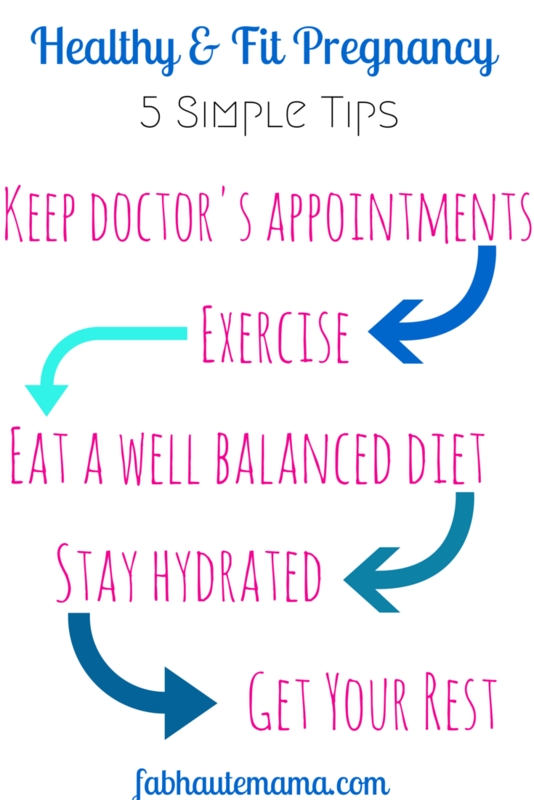 Make and keep all appointments and consult your doctor if something feels off. If approved be sure to get in 20-30 minutes of exercise daily. Walks, prenatal yoga, meditation and stretching are great during pregnancy. Eat well balanced and healthy meals. Try to eat every few hours to avoid massive hunger spells, dizziness and the temptation to binge. I confess: This has not been easy. Get as much rest as possible. Not so easy for me with a tot at home but do it for you. These tips are great for anyone wanting to stay healthy and fit in life. 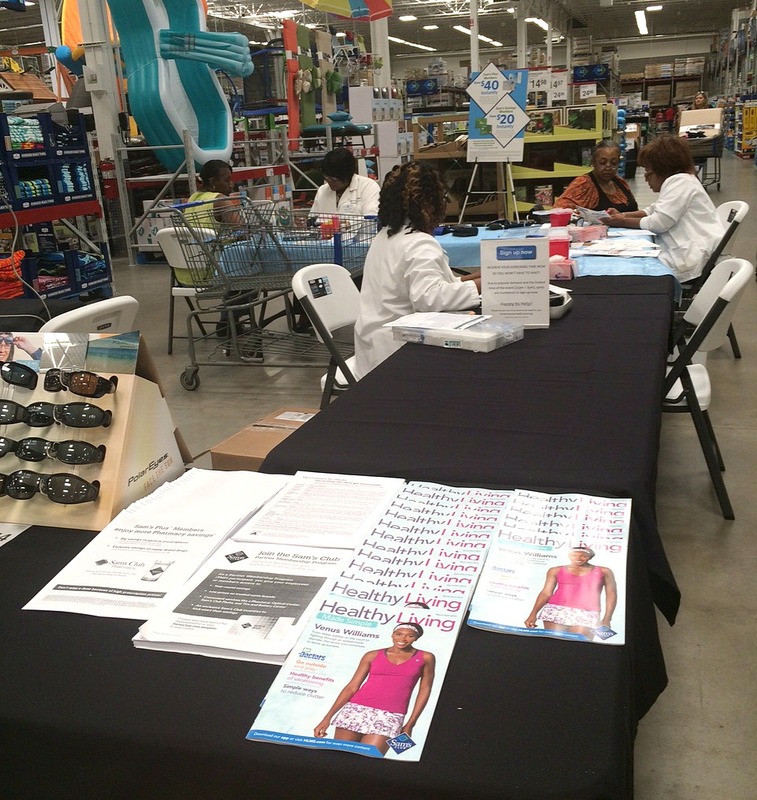 If you need a health screening, the next FREE health screening at Sam’s Club is on Saturday, May 9, 2015. 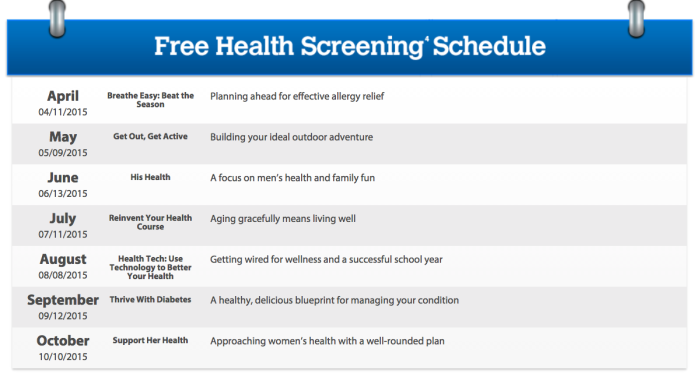 Here is the schedule for more dates to get a free health screening. Don’t neglect your health. Be sure to grab a #SamsClubMag while you are there. 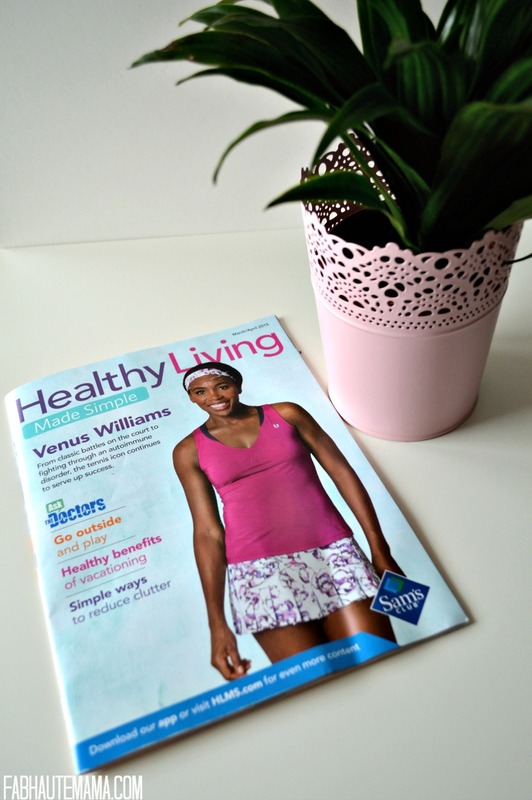 How do you keep yourself healthy and fit? Yes I saw her too. I have “no abs” left but I will bounce back. I had to keep looking at her picture. Great for her. Thanks Josselyne. Yes they work. I enjoy your tips on marriage. Will definitely start implementing some. We need a marriage pick me up. 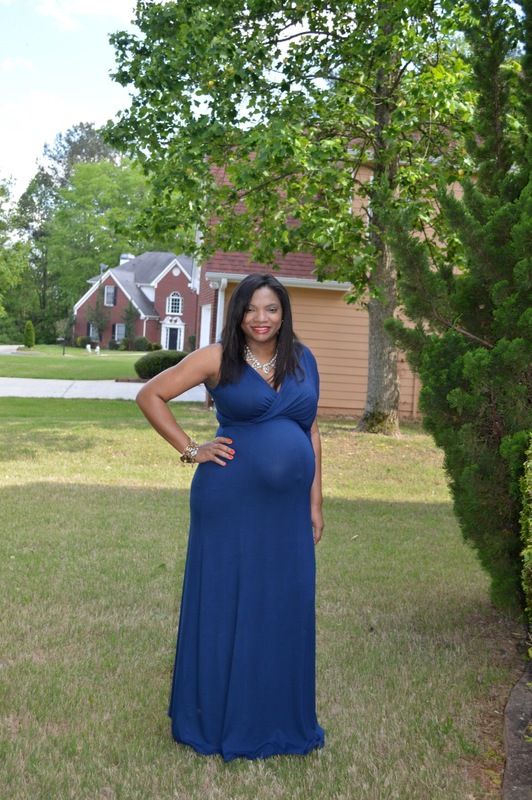 Your baby bump is cute! My sister and friend are older and both pregnant. I’ll have to tell them about this event at Sam’s Club! I also struggle with drinking enough water but I’m getting better. These are all great tips. I had no idea, I love when a story is full service. You can’t beat this for sure. I’m all about getting free screenings when you can. THanks Mimi. Yes I had no idea too but then this opportunity came up and I just happened to be there and feeling under the weather. I think it is great Sam’s Club does this for the community. Thanks Adanna. Ugh, I am so over the bathroom visits. LOL. Drinking plenty of water has always been a challenge for me before, during and post pregnancy LOL Actually while pregnant, I was more diligent in measuring my intake (at least with my first). Thankfully, we’ve gotten the kids in a really great habit of drinking water, they love it. Now I just need to learn to do better lol That’s so great that Sam’s does those screenings. I’ll have to look and see if BJ’s does the same. 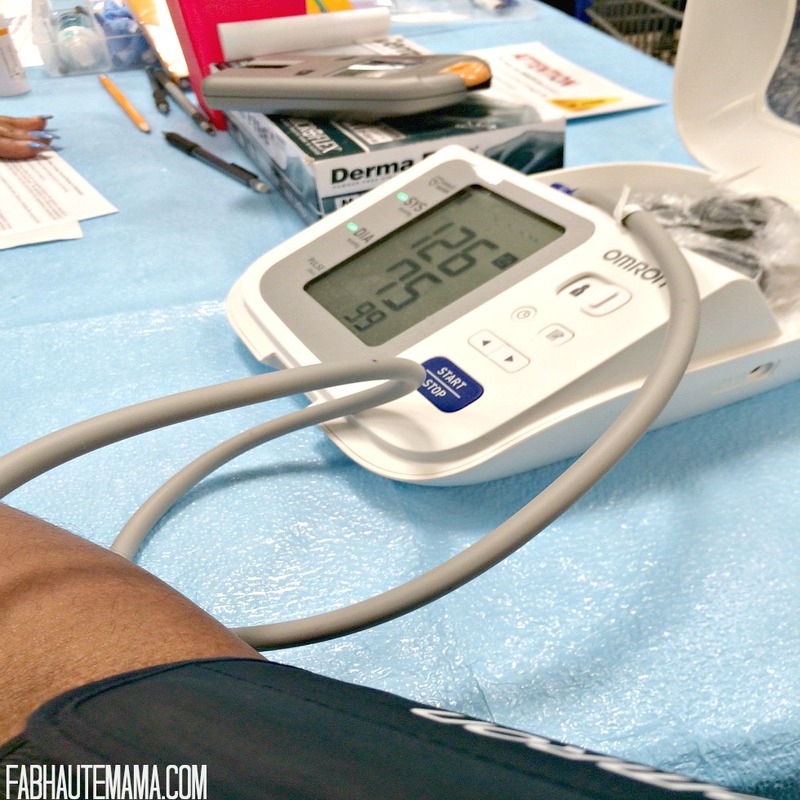 Definitely see what free health screenings are available in your area. I plan to drag hubby to the next one if he cancels his physical appointment one more time. He wil think we are going to Sam’s Club to shop. We will but he will surely get a quick screening while we are there! As for water… lady every time the kids drink it, you drink it to. Make some infused waters. You and the kids will enjoy them. Can I go to the gym while pregnant? You should check with your doctor.